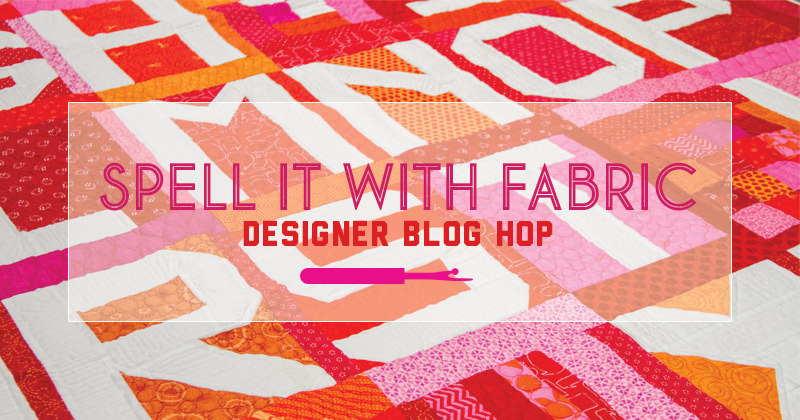 Are you having the most fun ever on the Spell it with Fabric blog hop? I know I sure am. Here are a few reason why. 1. Reading all the answers to the silly questions we asked the designers. The challenge was to answer the questions using their assigned letter. They did a great job. Of course we gave Polly and Laurie a pass on answering questions. Their letter was Q. 2. The comments each of you have left on all the posts have been fun to read and helps us get to know you a little better. 3. Watching everyone post their blocks they are making along the way. If you are posting your pics use the hashtag, #spellitwithmoda. We would love to see your progress. 4. I think the moda designers and our customers are the greatest in the world. Okay I am partial but seriously! You won’t find this as a schedule post on the blog hop. It is a bonus! Gina Martin has a fun surprise for you on her post on the 27th, but she also did a little something extra for all of us as well. That’s right, she drew out the numbers 0-9 and our snappy graphics person, Susan Stiff created patterns for each of you to have. See why I love being a part of this team of over achievers. Here is a link to download the numbers. That is just AWESOME! I was wishing for numbers, too! Thank you, thank you! I second that! AWESOME. I never even thought of having numbers, but wouldn’t it be cute to make the letters into a quilt front, and the numbers on the back!!!! Woo-hoooooo! By the way, THANKS GINA. And everyone else at Moda. This has been so much fun, and I’ve discovered a few more blogs to add to my Feedly. They are all wonderful. Perfect!! I have already downloaded them. Thank you so much!! Oh, thank you! I just finished downloading! This is my first blog hop – and so much fun! Thanks! Yeah, I am so excited for you. Yay! We’re going to end up with a complete test pattern . . . you and your team of designers are the best! thanks so much! these are fantastic!! Oh, thank you! This is so much *fun*. I’m loving this hop so much! The numbers are just icing on the (layer) cake! These are great! Thank you 🙂 I just love this blog hop! Thanks for the great bonus gift. You sure have a fun, creative team that you work with. I’m new to quilting and this is my very first blog hop and it’s fantastic. Have already made 2 christening gifts using the letters to spell out names. Now we have numbers, is it sad to say i’m excited?? Y’all ROCK! I’m having a great time collecting the letters and entering the giveaways. I’m downloading each file into a special folder on my computer, plus I’ve printed each letter and will make myself a booklet that I can carry to my sewing/cutting area, or even loan out to a friend. Thank you for giving us even more than we bargained for. I just love how you provide us with so much inspiration! I can’t wait to start working on my alphabet and now I have numbers . . . heaven for a retired math teacher :-)! Oh this was a surprise! A wonderful treat Thank you so much !!!!!!! This has been so much fun. I love the letters and after I get through fixing roof leak damage in my sewing room (of all the rooms in the house!) I am going to make some. Thanks Lissa! I thought numbers would be cute too. This has really been a fun hop, loved seeing the new lines, reading the great answers and just getting a better feel for your designers. What fun. Thanks. A quilt is on the list, maybe May! I am so excited for the numbers. All sorts of cool possibilities with letters and numbers. I love the numbers … what fun this has been. I have really enjoyed doing these and have ideas for using the numbers. Thanks sooo much!!! Wouldn’t it be fun to do the numbers as part of the back to a big quilt? What a treasure to find, thank you for the bonus. Ummm . . . any possibility we might get lower case letters and punctuation, too? I know it’s a lot to ask, but I’m a novelist, and I’m just bursting with possibilities! Thank you again for the wonderful patterns and the SO FUN hop! Thanks so much for the numbers! What a great hop. Thank you for the numbers!!! What a great surprise! You never know when you could use numbers. Ok I was excited and got carried away. I meant thank you so much! Now everything is complete in the world – we have numbers to go with our letters. The possibilities are endless. Thanks! Fabulous. Thank you so much! Perfect compliment to the letters, makes so many different things possible to personalize quilts. I see letters and numbers incorporated into the quilt backing, perfect finishing touch. Thank you! so cool! I was thinking I need numbers, too. Thank you so much! You guys are awesome! Thank you so much for the numbers to go along with the letters. What a perfect finish to a fun blog hop! Simply Wonderful conclusion! Can’t wait to see the last few letters, and the setting…..Love these blog hops….Thanks! Yay numbers too! thank you so much! Wow! Numbers! Love it. Thanks. Thank you for the numbers, love them!! This has been so much fun! Thank you for the letters and the hop. Been lots of fun each morning hopping around! Many Thanks to everyone involved with the blog hop. This has been the most fun I’ve had in a long time! OK. I don’t get out much. Thanks again and looking forward to what’s next from MODA. I like the number also. Thanks for that and the letters. This has been so much fun and it’s great to have the numbers too!! I love MODA and appreciate all the great fabric, designers, and patterns all of you create for all of us!! Thank You SO MUCH!! I just found the number this morning. This has been great fun and look forward to making the blocks soon. Thanks — just the right thing to top it off! thanks for the bonus blocks. Opps! I may have left my comment on the jelly roll blog entry below! Sorry . . . Anyway, love the numbers! Once again, you folks are just amazingly creative & inspiring to all us quilters! Thanks for all your hard work at Moda & this blog site . . . two of my favorite things! This has been so much fun. Thank you for all the work and inspiration! Awesome — thanks so much !